Lee Rhiannon will be speaking at the following event on 27 October. Shelves are groaning with reports by human rights monitors, amassing evidence of atrocities in Sri Lanka's civil war. Audiences in Australia - and many other countries - have seen the documentary, made by the UK's Channel Four TV, with its compelling visual material. And yet governments - and international bodies such as the UN and the Commonwealth - hold back from decisive action. What can Australia do? What can journalists do? What can you do? On Tuesday 20th September 2011 Lee hosted a roundtable in Federal Parliament to look at furthering the call for an independent war crimes investigation in Sri Lanka. The major parties, in rejecting a Greens Senate motion today calling for Sri Lanka to be suspended from the Councils of the Commonwealth, have failed to take action on the war crimes committed in Sri Lanka during the final stages of the civil war, Greens Senator Lee Rhiannon said. The motion below, supported only by the nine Greens Senators, follows a round table on Sri Lanka held at Federal Parliament on Tuesday. 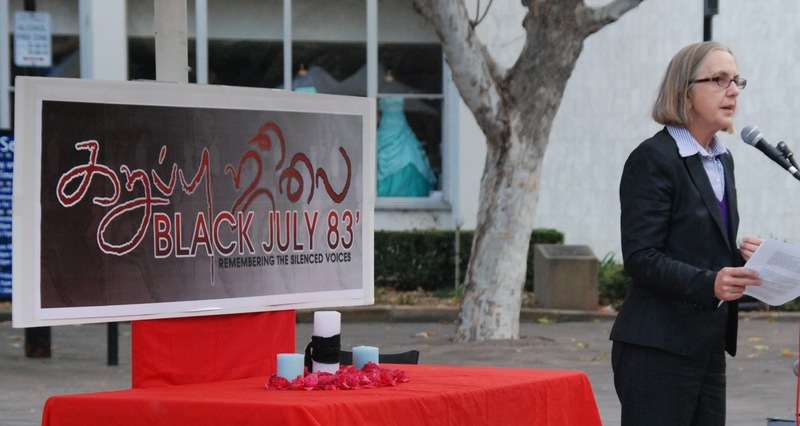 On Saturday I joined members of the Sydney Tamil community and their supporters at their annual Black July vigil. This moving event takes its name from the July 23 massacre of possibly 3000 Tamils in Colombo. The year was 1983 and Sri Lankan Government backers initiated riots and killings. Will the Australian Government finally raise its voice for the Tamil people? Standing among the 1000 plus Australian Tamils at Martin Place last week (18th May) to remember the Tamils massacred in the 2009 war in Sri Lanka, it was very obvious that the trauma for the community is still so deeply devastating. What has become clear to me is that the Australian Government's silence during and since the 2009 war adds to the pain the community is enduring.